This movie could go either way. It’s a Saturday Night Live spinoff, but it’s from the “good” years of SNL. It’s about a couple of slackers, but they’re played by Mike Meyers and Dana Carvey. I’ve seen a few Wayne’s World segments, and it doesn’t seem like they could translate to long form, but hey, at least it’s not Coneheads. I’ve been getting away from saying why I chose the movies, but I really have little to say this time. This movie has a strong following and it’s always been my intention to see it. Between opportunity and blogging, the time is now. 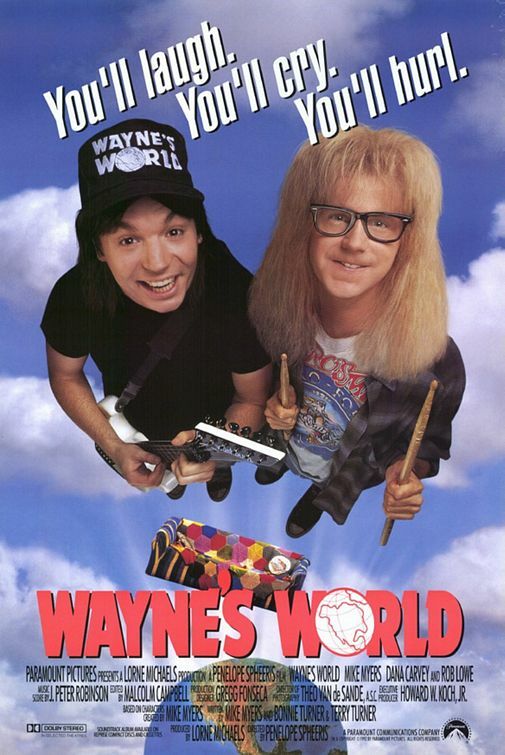 The SNL sketches this movie is based on are productions of the fictional “Wayne’s World” public access show, hosted by Wayne and Garth from Garth’s parents’ basement. After running a typical sketch framed by a couple watching TV in bed, the first thing that strikes me about the format is that Wayne and Garth break the fourth wall to narrate. On the surface, this isn’t much of a change, but it’s actually rather drastic. In the talk show framework, it makes sense for them to talk to the camera, because it’s really there. In the movie, they go from breaking the fictional fourth wall to breaking the “real” fourth wall. In the sketches, they’re not talking to the real audiences. I could go on, but I’ve already spent too much time on this. In short, if this movie was made five years later, they could have framed it as taking a jump to reality TV, because that’s more or less how it’s played. In this movie, a couple slimy producer types get Wayne and Garth into a contract and get sponsorship from the local Arcade mogul. Meanwhile, Wayne has a blossoming romance with a bassist named Cassandra. As the duo deal with their newfound wealth, the producers hijack the show into an infomercial for their sponsor. It took a while for me to see anything to hate the villains for. Sure, they sold Noah’s Arcade a show they didn’t yet own, but they made their money, and got a lot for the heroes as well. They were smarmy in general, but until the young, smooth one started seducing Cassandra, I was just waiting for them to become the villains they were supposed to be. The method of adaptation is basically to transplant the characters into a real plot. They have to grow significantly to fill it, but I think it works. Garth gets plenty of time on his own to expand from dorky sidekick to dorky shrinking violet loveable neurotic geeky sidekick. If anything, he’s too good. I wanted more of Garth, and started to want Wayne to just shut up. As Garth and Wayne realize what these guys are up to, they hatch a mega-awesome plan to win back Cassandra and give comeuppance where it’s due. As far as the end goes, it’s entirely unpredictable, but also unsatisfactorily unnatural. Characters who are not Wayne don’t really get the resolution they deserve, and – while I wouldn’t say this about many endings – really makes the past hour and a half worthless in some respect. Watch this movie: Because it’s Excellent. Don’t watch this movie: if Extreme Closeups make you hurl.